...or don't practice your tango between classes...it's not lack of motivation. In this TED talk (one of the 20 most popular TED talks ever!) Mel Robbins, a former criminal defence attorney turned on-air commentator exposes the myth of motivation. Mel also explains how to make the micro-decisions that will help you to step out of your comfort zone - the pre-requisite action to any worthwhile goal. Mel abides by the '5 Second Rule' (not the one about food dropped on the floor!). You can read more about that approach here. "So here's the one-liner definition of the 5 second rule: If you have an impulse to act on a goal, you must physically move within 5 seconds or your brain will kill the idea." Take action within 5 seconds. Be aware that your mind, if given time, will always find ways to stop you from taking action; bringing up a tonne of reasons why you shouldn't act (such as the classic one for Sydney-siders - bad weather!). Do something towards your desired goal - book that class, put on your dance shoes, or whatever else you need to do to get started! 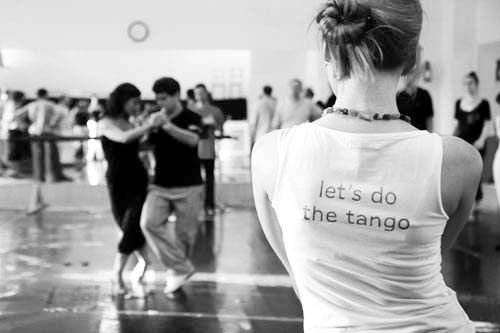 ☆ Find out here about SoTango's courses in Bondi and North Sydney - catering to all levels from beginners to all levels.